I can’t spend all my time writing about the pipeline or I’ll end up depressed. There’s lots to talk about in Cameroon…and one thing I can’t resist is the food. Cameroonian food is delicious. I say it’s the best in Africa. Of course, I should say it’s the best African cuisine I know, but I don’t think I’ll find better. Cameroon has some 250 ethnic groups, each with its special dishes, and that alone makes for an extremely varied cuisine. Then, there’s such an abundance of great ingredients: the markets are jammed with a vast array of vegetables, fruits, grains, nuts, beans, tubers, peppers, spices — a profusion of colors and perfumes. Cameroon produces coffee, tea and chocolate. Fishermen bring in a variety of fish, seafood and shellfish everyday. 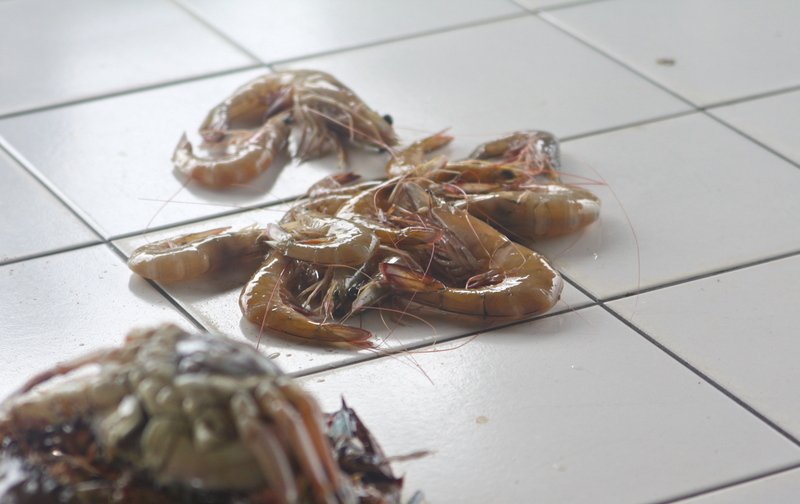 Even the country’s name is connected to food: According to legend, when Portuguese explorers arrived at the mouth of the Wouri River (site of Douala today) in the 15th century, they were so amazed by the quantities of shrimp in the water that they called the place Rio de Camarões (“River of Shrimps”), which later became Cameroon. Cameroonians also love food, eating and drinking. 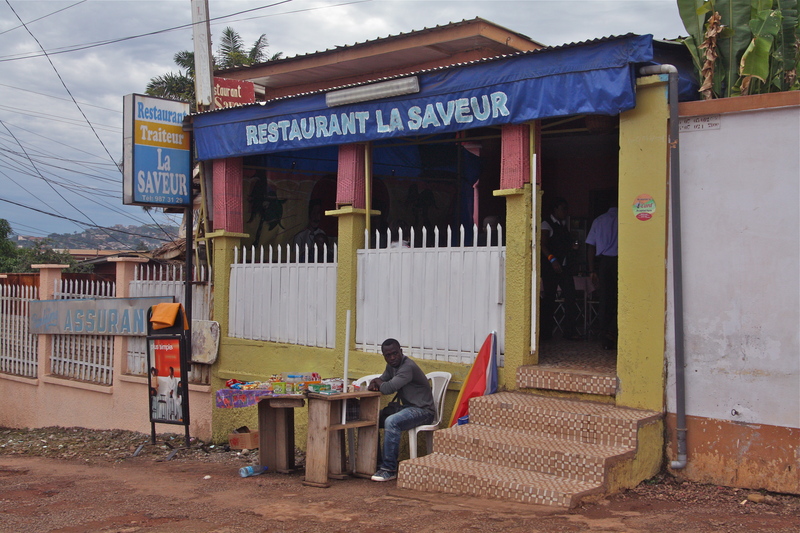 Cameroonians’ love of food, combined with the French colonial experience, results in lots of restaurants. This is really a country where you’ll have no trouble finding a good place to eat, although the food and restaurant culture is somewhat different in Cameroon’s two Anglophone provinces. One of Cameroon’s signature dishes is Ndole. Ndole are bitter leaves, which are hard to find and expensive outside of Cameroon and Nigeria. People sometimes prepare Ndole with other greens, but if you don’t use the Ndole leaves, there’s really no point — it’s not the same! The leaves are blanched and squeezed dry several times to reduce the bitterness. They’re then cooked with a bit of palm or other oil, onions, garlic, ginger, chili peppers, ground seeds (egusi) and seasonings. Ndole, like many dishes, is often cooked over a wood fire, so it has a slight, smoky flavor that mixes deliciously with the bitterness of the leaves. Ndole is typically served with meat or fish and plantains (steamed or fried), miondo (fermented manioc paste wrapped and steamed in banana leaves) or rice. 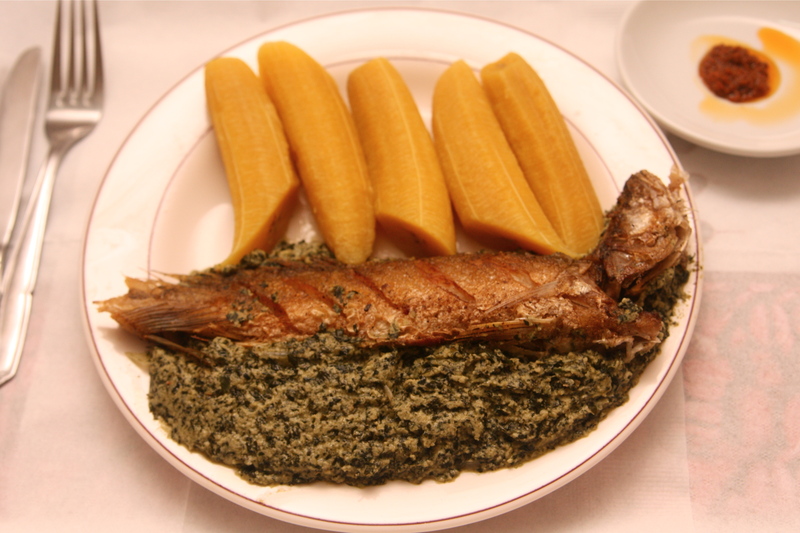 Ndole is the first dish I want to eat when I arrive in Cameroon. You can find good Ndole in many places. My first plate of Ndole this trip was in Yaounde, at La Saveur. The restaurant is cute, affordable and the Ndole is wonderful. More elections in Cameroon. Does anyone care? This entry was posted on Friday, November 13th, 2009 at 7:38 pm. I have heard so much about Camerounian food! Glad to have tuned into your blog when that was the subject. Just reading what you wrote puts me there. Hungry. Yea,Lolis Elie you really need to go to Cameroon. We have the best dishes in Africa.